Our ancient ancestors spoke of a legendary place — where the young and young at heart could test their skills against a magical, electronic device, using strategy and their reflexes at 25¢ a pop. These wondrous havens were called “Video Arcades” and these hulking machines were called “Video Games.” Believe it or not kids, it was the only place you could play a decent-looking, somewhat sophisticated video game, housed in a heavy, laminated wooden cabinet, because at the time the only thing you could play on your “push-button” phone was a tune like, “Mary Had a Little Lamb.” There is another legend however, that at least in one or more of these Video Arcades in Portland, Oregon in 1981 A.D., there lurked a mysterious Arcade Game called “Polybius” and it had a much more nefarious purpose than to provide amusement and rook a kid out of a short stack of quarters — it may have been there to try its hand at brainwashing you, and then report its findings to a sinister government agency. There were reports of players who suffered terrible side effects from the visual phantasmagoria of the gameplay, like severe headaches, nausea, memory loss, nightmares, an aversion to playing any video games afterwards and in some extreme cases, suicide. But were these reports true? Did this diabolical game ever exist? 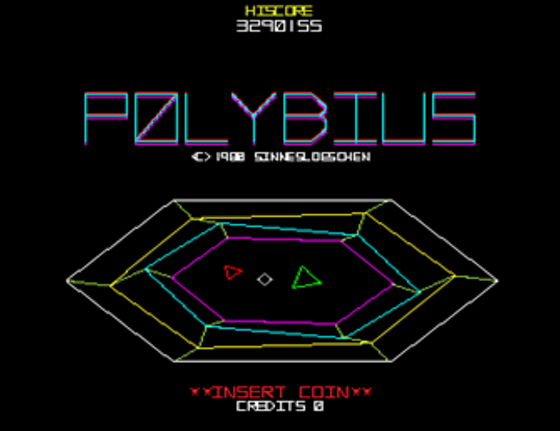 Was the legend of Polybius just an “Urban Legend?” One thing we do know is true, prior to the legend of Polybius, a secret government agency really did try to zap unsuspecting people’s brains and take notes. – Miyamoto Shigeru, the “Father of Modern Video Games” and Co-creator of The Legend of Zelda, Donkey Kong, Super Mario Brothers and many more. Episode 031 – “Polybius Ultra” Produced by Scott Philbrook & Forrest Burgess; Ryan McCullough Sound Design; Research Assistance by Tess Pfeifle. Copyright Scott Philbrook & Forrest Burgess 2016. All Rights Reserved. 1) Opening title screen-shot of an imagined re-creation of the mysterious “Polybius” Video Arcade game. This re-created game is based on the legend’s passed-down descriptions of the original game, as no original game play data is known to exist. Some have claimed to own computer ROM images of the original game, but no one seems to be able to offer any proof. 2) A screen-shot of the very real original Arcade Game “Tempest.” 3) A “freeze-frame gag” as the writers of the Simpsons called them, where Bart Simpson is about to play a video game called “Triangle Wars” at the Springfield Mall. 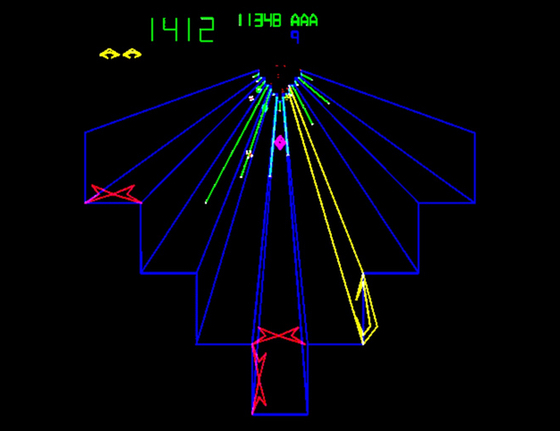 Notice the “Polybius” game to his right, and the joke stencil, “Property of U.S. Government” on the cabinet’s face. Also, the game only seems to need one button to play it — you hit it, and the game takes care of the rest. Image property of “The Simpsons” television show; Copyright 2006 by 20th Century Fox, from the Willamette Week article listed in the links section.